Creating an organizational chart with Nevron Draw is super easy. In this how to topic I will show you how to create a relatively complicated one within 5 minutes. 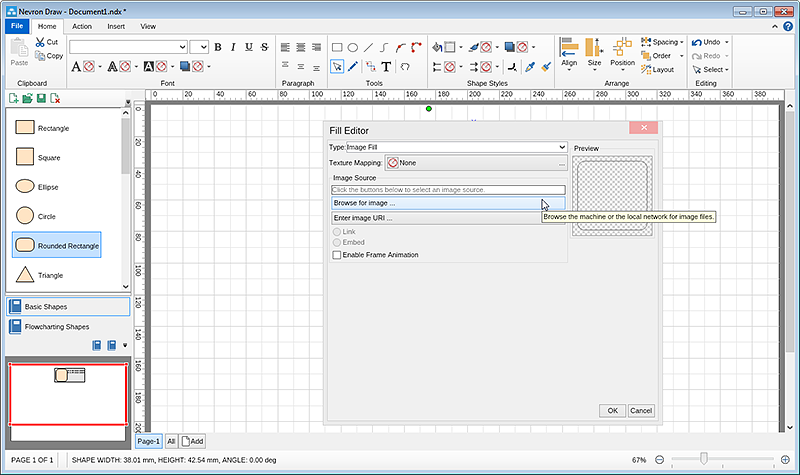 Open Nevron Draw and set your page properties. 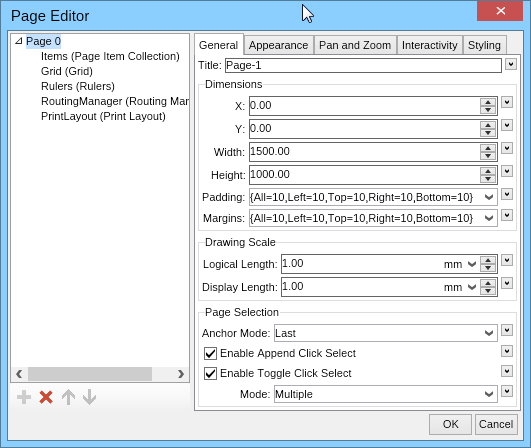 For this example I am going to use page with width – 1500 and height – 1000. Once you have everything set, it’s time to get started with the Organizational chart itself. To do this I will use couple of rectangles. A bigger one as a base and a smaller one with rounder corners in which I will insert a picture of each person on each specific position in the company. Next to the picture I will include couple of lines of text. The first line will be the person’s name and the second his position in the company. 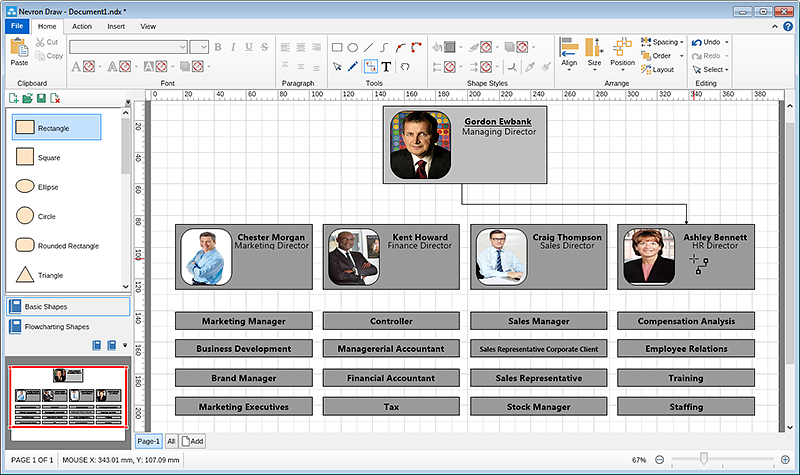 You can of course adjust the positioning of pictures and text in your organization chart according to your own preferences. Select the shape and click the “Geometry fill” button on the “Ribbon” -> Go to “More Option”. 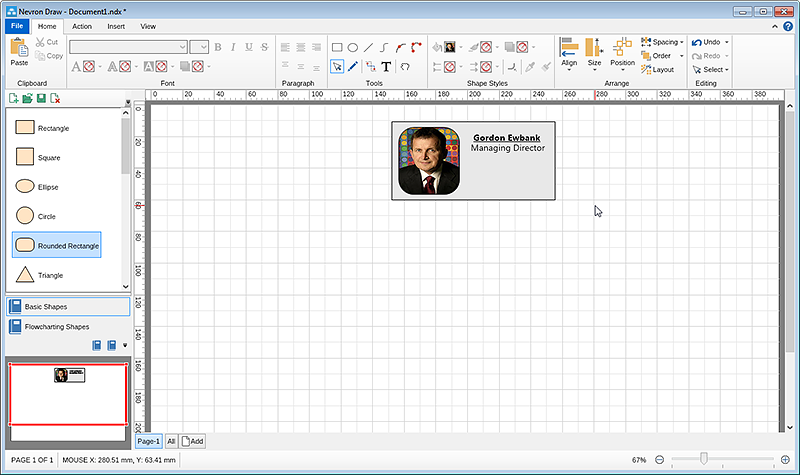 On your screen is going to appear the “Fill Editor” window. 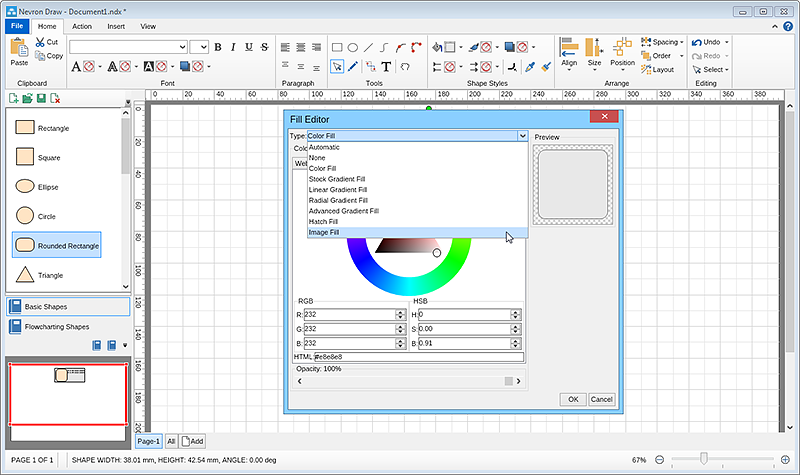 Click the small arrow next to the “Type: Color fill” and choose “Image fill”. Click either the “Browse for image” or “Enter image URL” button according to how you are going to insert your pictures. 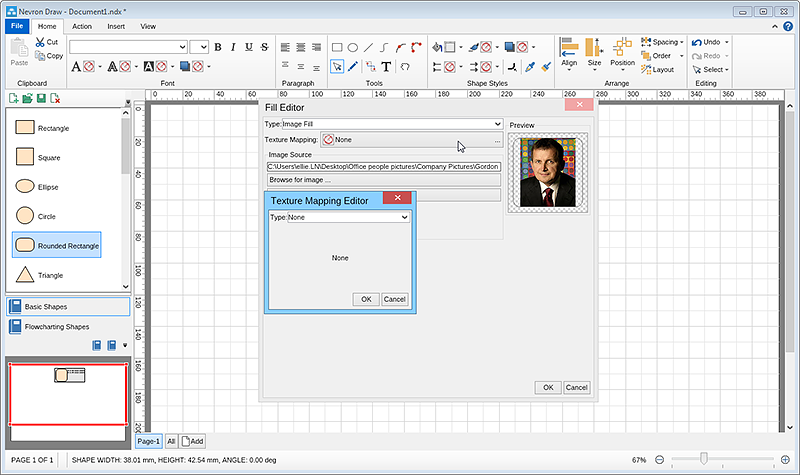 Once you have chosen the picture you wish to insert, click the “Texture Mapping” button. This will open another small window where you need to choose the “Stretch Texture Mapping” option. By choosing it the picture will stretch as much as it needs to fill up the entire shape. 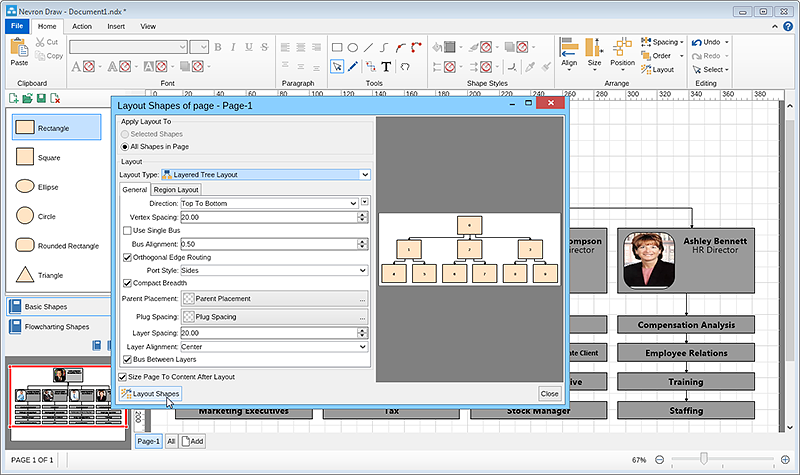 After you have inserted the picture you can add the rest of the elements, such as the background frame (another shape), the name of the person and his/her position and all the rest of the needed information. To make sure your arrangement will be retained as you continue, I suggest you group all elements together. To move further on your Organizational chart, my advice is to Copy and Paste the structure you have made. This way you will ensure that all rectangles and text lines are arranged exactly the same way. When you are ready filling up all the data for your Organizational Chart the only thing you have left is to create the connections between the shapes in your diagram. Unless you are looking for a specific arrow, my advice is to use the “Connector tool” from the Ribbon. To do that select the tool and then by clicking the left button on the mouse select the starting point of the connector, keep the button pressed and drag it to the middle of the shape you want to connect it to until you see a tooltip saying “Glue End to Shape”. I am suggesting this connector as it is designed to be flexible – when you connect shapes with it you can move, resize or rotate them and the connector will automatically adjust itself to never cross the shape. 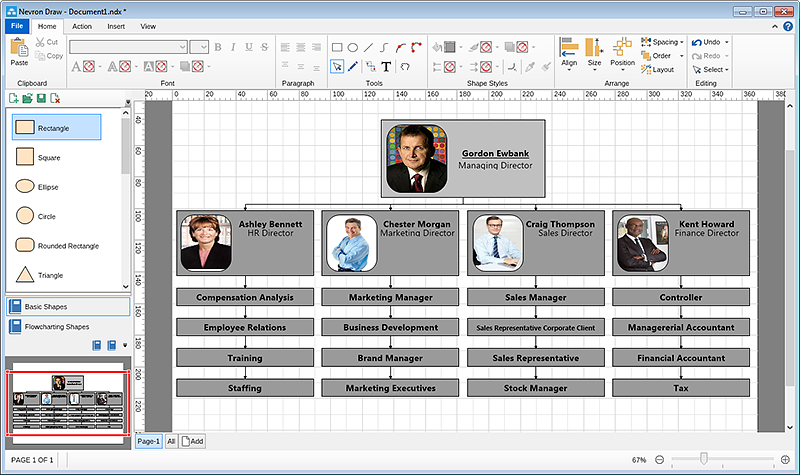 As the organizational chart is in its core a layered tree type and this is one of the predefined layouts provided by Nevron Draw, I will select all my shapes and add automatic layout to make sure my diagram/organizational chart is perfectly aligned.